Four local entrepreneurs have each won £500 of funding to help grow their business after triumphing in the Entrepreneurial Barnet Competition, which was organised by Middlesex University, Barnet Council and Barnet and Southgate College. The winners, who can now take advantage of free mentoring and support from business experts, will go head-to-head in a grand final business pitch on 8 March 2016 at the head office of Brent Cross regeneration scheme developer Hammerson, which is sponsoring the competition. The overall winner will receive a further £500 in prize money and advice from a business mentor. BA Business Management student Humara Khan triumphed in the Middlesex University Undergraduate Students category with her Candy Collection business, which creates personalised jewellery and key rings. Humara will spend the money on equipment to help the business expand. 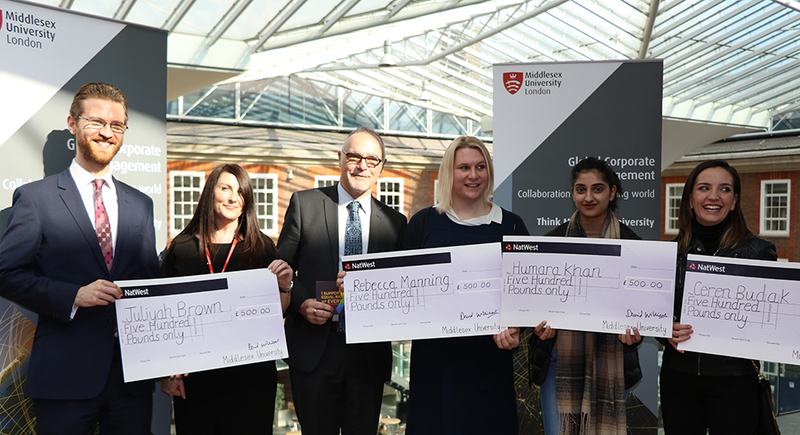 The Middlesex University Postgraduate Students and Recent Alumni category was collected by BSc Nursing (Mental Health) graduate Rebecca Manning, who won for her Community Interest Company, Happy To Be, which aims to improve mental health for people who question their gender identity. She intends to spend the prize on website and social media promotion. In the other two categories, Juliyah Brown from Barnet won the Borough of Barnet Residents category with her company, Queen Angel Creations, which creates handmade flowers and unique gifts for all occasions. Juliyah says she will spend the prize on advertising and business support. Barnet and Southgate College Foundation Business degree students Ceren Budak, 31, from Finchley, and Safiye Arioglu, 25, from Southgate, were successful in the Students at Barnet and Southgate College category with their submission for Hairtastic, a mobile hair and beauty business that will visit festivals. Ceren said: “We actually had no hope that we would win so it feels so good to win the £500. David Williams, Director for Corporate Engagement at Middlesex University, commented: “It is always great to celebrate success and especially so in the area of innovation and enterprise.